Aloo(Potato) paratha is stuffed bread or chappathi. Who won’t like Aloo? There are many methods and variations of making this paratha. Adding different ingredients with Aloo varies in taste. 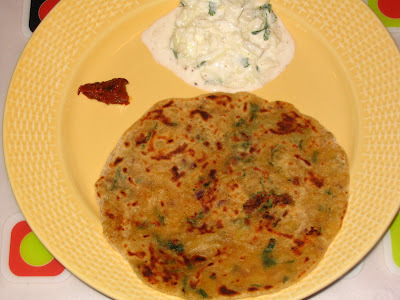 As this stuffed paratha has all spicy and masala flavour it can be served with curd or simple raita. So that we can enjoy the taste to the fullness. My way goes like this, enjoy!!!! Prepare the dough using the dough ingredients. For stuffing add tsp oil in a frying pan then add fennel seeds, when it splutters add onions and saute till light brown. Now add this mixture and chilli, garam masala powders to the mashed potato. Add coriander leaves and divide them to the size of chappathi. More stuffing more taste. Now divide the dough to equal sized balls and now roll them flat. keep the filling in the rolled chappathi.wrap it like we keep for dumpling or kozhukattai. Dust with dry flour, slowly roll it again by dusting with dry flour. Don’t press it hard slight pressure is enough make it round and flat. Now put it in hot griddle toast both sides. Apply ghee atlast on the top of paratha. Serve with raita and pickle. Here I served with cucumber onion raita which is garnished with coriander and pinch of roasted cumin powder, chilli powder. If Alexander wud hav tasted Aloo Paratha, he ceratinly wud hav stopped battlin ny further to conquer t world....I felt abs hipnotizin after the treat n critics agreed with me for the first time!!!!! !